According to the New York Times, "Celery contains phytochemicals called phthalides, which some studies have shown reduce stress hormones and work to relax the muscle walls in arteries, increasing blood flow. As a result, it has long been used in Chinese medicine to help control high blood pressure. 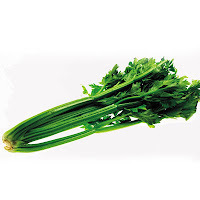 Celery is an excellent source of vitamins K and C, and a very good source of potassium, folate, dietary fiber, molybdenum, manganese, and vitamin B6." Unfortunately, most people don't know there exist a wide variety of delicious, nutritious and STRESS REDUCING celery recipes, so celery tends to go unused in the refrigerator after you buy a bunch for a soup or stew, or for that Thanksgiving stuffing recipe that calls for only one stalk." So I've compiled some tips and easy to make recipes from a variety of sources because A Word to the Wise T.I. should be sufficient. TIPS FOR USING CELERY: use the tough outter stalks in soups and stews and stuffing, and the more tender inner stalks (aka the celery heart) in salads. And here are some mouth watering recipes guaranteed to melt the stress away, while delighting the taste buds. Wash the fruit and vegetables using water and a stiff vegetable brush. Keep the leaves on the celery. Cut the peel off the lemon - some people like to leave this on but I find this makes the juice too bitter. Slice the fruit and vegetables to fit your juicer. Toss together the mushrooms, celery, parsley, and chives, and season with salt and pepper. Mix together the lemon juice (or lemon juice and vinegar) and olive oil, and toss with the vegetables. Just before serving, toss again with the Parmesan. Chop the onion, potato, carrots, and celery into pieces that are about 1/2-inch or smaller, cutting everything roughly the same size to keep cooking time uniform for all ingredients. 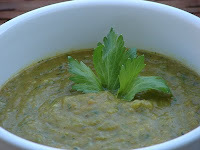 In a large thick-bottomed soup pot over medium high heat combine the olive oil, onion, potato, carrots, celery and a few big pinches of salt. Saute for about ten minutes or until the onions and celery soften a touch and expel some water. Stir in the garlic and add the stock. Bring to a simmer and let cook for another 10 minutes or until the celery, carrot and potatoes are just cooked through - resist the urge to over cook them into mush. Stir in the rice a few minutes before the potatoes and carrot are cooked though. Remove the soup from the heat and ladle into soup bowls. Top each with a generous drizzle of the celery leaf pesto (opt) and/or some Parmesan cheese. * 1/4 cup extra-virgin olive oil. If you have a food processor, puree ingredients for about 30 seconds. If you do not have a food processor, grind, mash and blend ingredients in a motor and pistal until well blended. Top with one of the following: 3 ounces crumbled crispy thinly sliced bacon or pancetta, or grated Parmisan cheese. Arrange celery leaves or salad greens on plates. 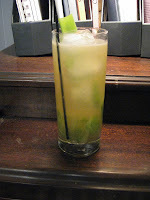 Add the celery and apple. Drizzle with the dressing. Top with toasted walnuts.